The cover of Black Panther #1. Black Panther’s Wakanda is the kind of Afrofuturist fantasy that’s been largely missing from the mainstream pop cultural canon. Unlike most other genre fiction that could scarcely imagine black people living in the future, Black Panther envisions a world in which an entire nation of uncolonized Africans became the definition of the future. For all of Wakanda’s unmatched technical prowess, though, there’s always been something (quite literally) grounded about the people in Marvel’s comics that made their story feel as if it were butting up against a wall. 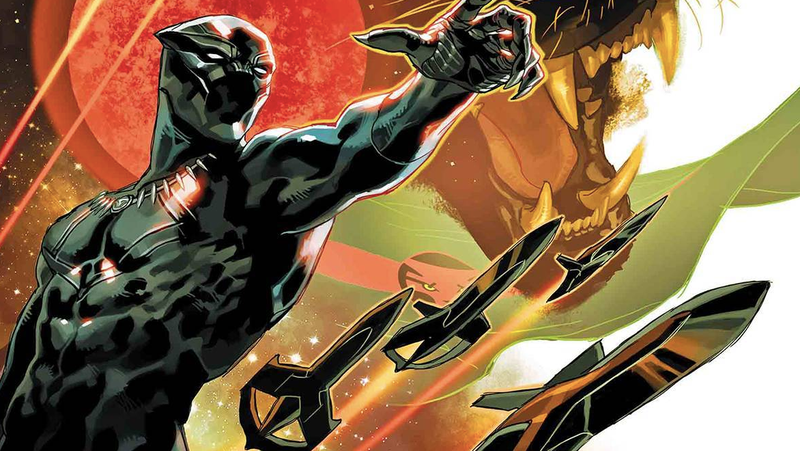 While many of Marvel’s other heroes and super teams have frequently taken to the stars on countless adventures, the bulk of Wakanda’s significant history has been curiously earthbound. As often as the Earth is put in peril and given how much the Wakandans value their solitude, it always seemed inevitable that, at some point, they would set their sights upward and beyond. Finally, that time has come, but not in a way that you might have expected. The new Black Panther #1 from Ta-Nehisi Coates and artist Daniel Acuna is the beginning of the type of story arc that fundamentally reorients the trajectory of an entire constellation of characters in a profound way. After decades of seeing of Wakanda depicted as a technologically-advanced, though largely sandboxed paradise, “The Intergalactic Empire of Wakanda” boldly brings Black Panther into the future with a vision of what’s to become of the country. The point in time where the arc opens is purposefully unclear, but “The Intergalactic Empire of Wakanda” doesn’t really want you to spend too much time worrying about the when of things. It’s what’s happening that’s really fascinating. In this future, a small group of Wakandans set out in search of a new planet to colonize and call their own. Though their search was arduous and progress was slow, in time they founded a new land they named “Bast” for the panther goddess who watched over their ancestors. Unlike Earth’s Wakandans who, over time, came to maintain peaceful interactions with outsiders, the spacefaring Wakandans took their tradition of isolationism to the extreme in order to survive, creating a distinct kind of hostile, expansionist culture on Bast. “The Intergalactic Empire of Wakanda” is an origin story both for the empire itself but also for a “new” Black Panther—though it’s immediately clear that the hero the comic focuses on is some version of T’Challa. After being haunted by visions of a white-haired, blue-eyed woman telling him to come back to her, the stoic hero awakens to discover that he’s been enslaved by a race of alien beings who don’t look like him. Though he doesn’t know who or where he is, he knows that he needs to escape and nearly does before he’s brought down by a hail of stun gun blasts. The man’s dragged off to the vibranium mines where he toils day in and day out all the while plotting his escape. There’s a distinct extraterrestrial energy that Acuna’s illustrations give to the story that make it look and feel distinct from previous Black Panther comics. Bast is a dark, gleaming landscape whose technological accents feel cold and harsh compared to Wakanda’s. T’Challa getting into a fight with another prisoner. Aside from a helpful explainer at the end of the comic, little is articulated about the Intergalactic Wakandan Empire’s politics, which makes the book that much better. You’re left to wonder about how their worldview shifted so drastically away from that of Earth’s Wakandans because the implications are weighty. Wakanda represents the idea of what all could have come from the African continent were it not for the devastating, lasting impacts of colonization and slavery. “The Intergalactic Empire of Wakanda” pivots away from the assumption that Wakandans would simply journey into space to peacefully settle a planet; instead, it introduces the idea that it may, in some ways, be grappling with a generational trauma that causes oppressed communities to recreate the behavior of their oppressors. If that’s the case, then the story “The Intergalactic Empire of Wakanda” is telling isn’t just about Wakanda itself, but also what the idea of Wakanda represents to all people who’ve been colonized. It’s a big, heady space to take Black Panther to, and this is a story that promises to take all of its characters to new heights.